Shares of EMC fell heavily yesterday as the company made a slew of announcements including the acquisition of cloud storage startup, TwinStrata. EMC stock fell by 1.6% on the day that saw the value of the infrastructure giant fall to just over $54 billion (around £31.6 billion, AU$58 billion). TwinStrata is platform-agnostic, supporting Amazon S3, Rackspace Cloud, Google, HP and many other cloud storage providers and its CloudArray technology is probably what sealed the deal. The purchase of TwinStrata will allow EMC to bundle services such as disaster recovery, offline backup, tape replacement and multi-site file storage to its VMAX^3 enterprise clients in a transparent manner to cloud repositories. Speaking of the VMAX^3, three new models (100K, 200K and 400K) will replace the existing tiered models (10K, 20K and 40K) with its Dynamic Virtual Matrix architecture supporting up to 384 Intel Xeon, Ivy Bridge-based CPUs. 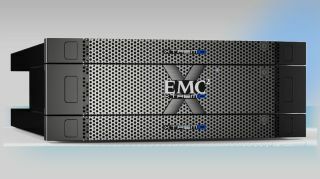 In other news, EMC upgraded the software for its all-flash array, XtremIO. Version 3.0 - which will be available as a software update later this quarter - allows bigger, faster clusters (up to 120TB X-Bricks with 12 active controllers, 50% higher IOPS performance) and offers inline compression and deduplication which offers up to 6X storage capacity boost (although your mileage will vary depending on the data). EMC has also unveiled a cheaper X-Brick, aptly named the Starter X-Brick that offers the same features as its bigger brother but with half the capacity (5TB). It also added an "Xpect More" programme for its customers with 7-year maintenance price protection, 3-year money back warranty and flash endurance protection. Last on the list is a major upgrade to EMC's Isilon OneFS (including native support for Hadoop Distributed File System) plus new Isilon products (S210 and X410) as well as solutions that target Big Data analytics clients and improve their capacities to handle mammoth amounts of unstructured data (i.e. data lake).